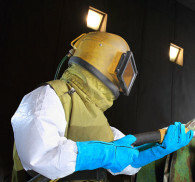 Wet-slurry abrasive blasting processes, such as those performed by the advanced systems developed by Wet Technologies, are being increasingly utilized throughout Aviation Manufacturing and Aviation MRO today — from bonding and etching newly formed components to remanufacturing various jet, radial engine, auxiliary power unit (APU), and landing gear parts to prepping surfaces for nondestructive testing (NDT) for exposing stress cracks. These applications include etching and bonding; descaling and cleaning; stripping paints from composites; stripping coatings in layers from landing gear and wheels; de-oiling, separation and disposal; wet peening and smoothening to reduce Ra values. The quality and effectiveness of these disciplines, and more, are greatly enhanced when they are performed using liquid abrasive blasting. Because Wet Technologies systems are compact, closed-loop and clean, you can easily and cost-effectively bring these traditionally subcontracted processes in-house — right onto your production floor. Consult with one our experts today and see how significantly wet-slurry blasting can speed lead times, reduce costs and cut labor from your Aviation Manufacturing and Aviation MRO processes. “With the mandate from Pratt & Whitney to discontinue dry oxide blasting, and going to wet blasting, we were all skeptical. Since buying 2 Aluminum Oxide Wet Blast machines we have become believers. Both have withstood the test of department 271. We are very rough on the equipment we purchase. The craftsmanship and also the ergonomics of the whole system are impressive. “We use Wet Technologies wet-slurry blast machines to clean our aircraft engine vanes after our laser hole drill process.…We are ecstatic about our two new machines as they have surpassed our expectations and I’m sure will be as reliable as the other six we have purchased.